Cork Craft Month 2016 is a month long series of multi-disciplinary craft events throughout Cork city and county; including exhibitions, open studio days, workshops and demonstrations running from August 2nd – September 4th. Cork Craft and Design is a multi-disciplinary group of craftspeople based in Cork city and county. This group is made up of talented Cork based makers including jewelers, furniture makers, ceramicists, wood-turners, textile artists, sculptors, bookbinders, glass artists, blacksmiths and quilters. 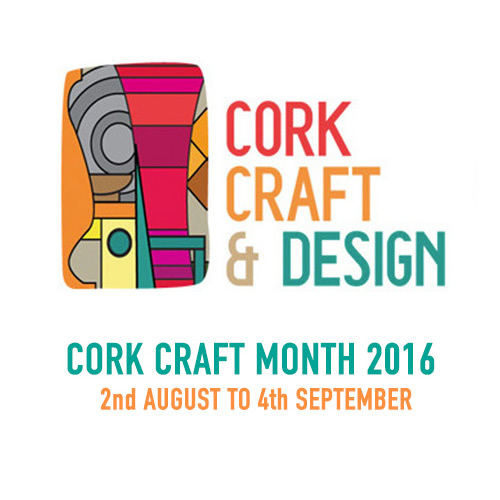 Cork Craft Month is the flagship annual event of Cork Craft & Design and has been running throughout the region for the past six years. Not only does this month long series of craft based events and exhibitions raise the profile of Cork Craft both nationally and internationally it also gives visitors to Cork the opportunity to browse, admire and explore a huge variety of Crafts first hand. Many of the events are run by the craft makers themselves, giving visitors the opportunity to engage directly with the makers and their fascinating and often beautiful work.